We flew into Johannesburg, South Africa and then basically had a huge road trip through all of Botswana up to Victoria Falls, Zimbabwe. While in Botswana we visited the Khama Rhino Sanctuary, Maun, the Okavango Delta, the Makgadikgadi salt pans, Elephant Sands, and the Chobe River. What were your favorite scheduled activities? 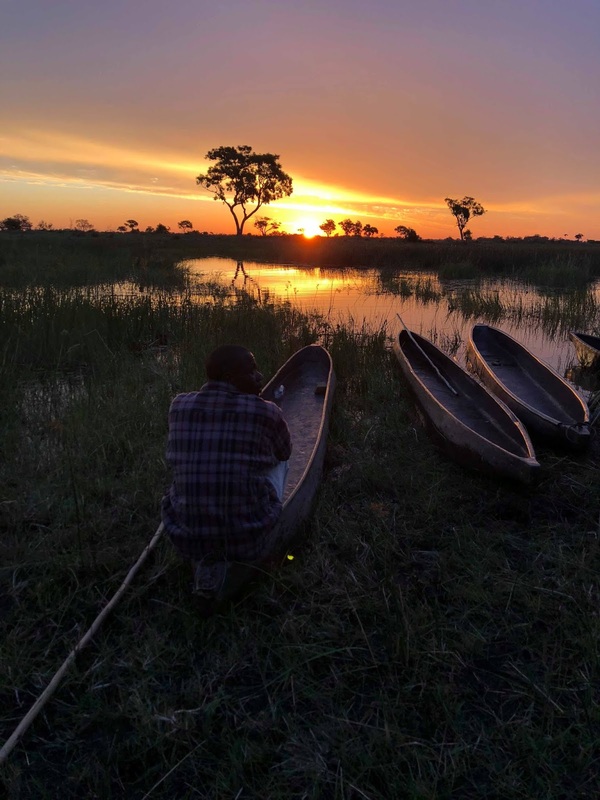 For me the three main highlights were camping in the Okavango Delta, seeing Victoria Falls, and our tour of the Soweto district in Johannesburg. Getting to see one of the natural wonders of the world was breathtaking, and the people that I was able to meet and learn from in the Okavango Delta and Soweto really made the whole trip worth it. What was your favorite experience in your free time? We had a free day while we were in Victoria Falls, Zimbabwe. The city is right at the border with Zambia so me a couple friends decided to go to the craft markets in Livingstone. The taxi driver that we had to get around the city was born and raised in the area, and he told us all about Zambian culture and history. My dad always says the best way to learn about a place is by talking to a taxi driver, and in this case he was certainly correct. That taxi ride made the entire trip to Zambia worth while. Were there any particular learning experiences that stood out on travel? I thought it was really interesting to learn about the importance of conservation for Botswana. We had a lecture at the Khama Rhino Sanctuary about the history of the organization and how it is not only benefitting rhino conservation. Since it is a project among the local communities, the sanctuary has been able to bring a lot of economic activity to the area. For Botswana, conservation is not only necessary for the vitality of the wildlife, but for the entire country. Do you have any recommendations for future students going on this travel? Many places in the world see Africa as being one amorphous country and culture. This could not be more false. Before you go on this travel take the time to learn about the differences between the countries you'll be visiting. It will make you have a better understanding of all aspects of life. What was the focus of the travel class you led? Natural resource conservation in the North/South development context, intercultural awareness, post-Apartheid politics in South Africa, and sustainable ecotourism. 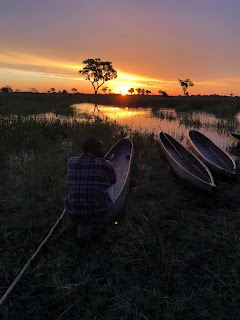 We traveled overland from Johannesburg, South African to Botswana, to include the Okavango Delta where we bush camped for 3 days as well as the Makgadikgadi Salt Pan. We experienced the Kama Rhino Sanctuary, Chobe National Park, the Zambesi River and Victoria Falls, Zimbabwe. We ended the trip in South Arica with a day trip to Soweto and the Apartheid Museum. What kinds of activities did you decide to schedule? A combination of academic lectures, game drives, overlanding by truck, camping in primitive areas as well as campgrounds, and interaction with local citizens to better appreciate the challenges of Southern African economic and political development, women’s empowerment, and natural resource conservation. What do you think were the most impactful experiences you and your students had on travel? Bush camping in the Okavango Delta and the Makgadikgadi Salt Pan, visiting wildlife in their natural habitat, interacting and sharing dance and song with the Botswana people, experiencing firsthand the human tragedy of Apartheid, and coming to appreciate the timeless natural landscapes of Southern Africa. How do you think the travel aspect of your class has enhanced the class overall? Given that the course was International Political Economy, the travel component brought to life the theoretical observations made in class - particularly with respect to development issues and policies, the realities of post-Apartheid South Africa, the trafficking and poaching of endangered species, and the challenges of sustainable natural resource conservation. Be academically prepared for the experiential components, psychologically prepared for the realities of traveling in a developing country, and willing to reflect critically on the myriad aspects of this academic travel well after our return. We did field work with a local environmental research organization and stayed the night in a hut in the mountains. 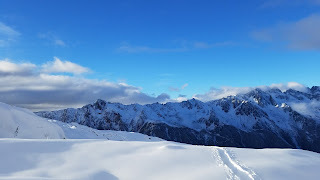 We also went hiking with beautiful views in the Alps every day! Exploring the town of Chamonix and going ice skating! Probably the fact that we were able to do hands-on research in phenology (species reactions to seasons) and help contribute to the knowledge of how climate change is affecting alpine ecosystems. Enjoy hiking and snow. Some days are a trek but the views are so worth it! My class was BIO 210T Alpine Ecosystems. It looks at the different types of ecosystems we find in mountains/the Alps and how humans affect those systems, putting a particular emphasis on climate change. We were in the mountains of the Lucomagno region of northern Ticino, around the source of the Rhine River in Grigioni, and the Mont Blanc region in France. The main emphasis was on field data collection in the various ecosystems, which generally meant hiking up and out to the study sites. We also met with experts from ProNatura in Switzerland and worked with a non-profit research group in France, the Centre de Recherches sur les Écosystèmes d’Altitudes (CREA), taking part in their citizen science program. Lastly, we spent the night in a traditional Alpine hut near Mt. Blanc. I think being in the field and getting to see both the systems we had studied as well as the impacts in person was very effective. Getting to hike through a meter of snow to the hut, while unplanned, was also a very memorable experience. As I mentioned above, getting to experience these systems and see the impacts of human use and climate change firsthand was invaluable. A class like this that only took place in the classroom would be much less effective way to learn about the material. Further, being able to interact with the people from ProNatura and CREA not only showed the students potential career paths, but also gave students diverse perspectives on these systems and issues. Be prepared for all types of weather, which means having the proper clothing and gear. 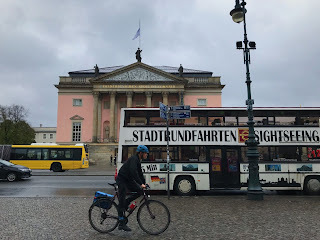 On travels like this one, I provide a suggested gear list for students early on and it is important to start making sure you have what you need as soon as possible--student may not think about the time right before travel being a very busy one. Also, if you are not used to hiking, start getting in hiking shape (e.g. walk down into and back from town, go up San Sal or Monte Boglia). We hiked almost every day, between 10 and 15 km with up to 800 m elevation differences. If you are not used to this type of activity, the first few days will be exhausting. In the early 1920s Georgia and Azerbaijan were annexed by the Soviet Union and were Soviet Republics until its breakup. Independence and the radical changes that began in 1991 have created tremendous challenges and opportunities. The focus of this academic travel is to understand the history of Georgia and Azerbaijan, and the changes taking place today. We visited numerous cities, from Tbilisi, the capital of Georgia, and Mtskheta, the religious capital of Georgia, to Gori, the birthplace of Stalin, Mount Kazbegi, and Baku, the capital of Azerbaijan. City tours (particularly the Old Towns); relevant museums; visits of the Parliament and meetings with parliamentarians (in both countries); meetings with officials in charge of refugees and internally displaced persons, and visit of a neighborhood for IDPs (in Azerbaijan); visit of religious buildings and meetings with religious leaders to understand the role of religion in local society; an optional day trip to the Mount Kazbegi in Georgia to experience the countryside. Experiencing Georgian/Azerbaijani hospitality through FUS alumni there; the mountain landscapes around Mount Kazbegi; the “supra” dinners; visiting the camp for IDPs in Azerbaijan. Since it was a 1-CR travel, the travel was the most important aspect of the class. The activities were designed for students to observe and experience social, political and economic transition. Take the preliminary travel assignments/preparation seriously; don’t choose this travel simply because it is an “exotic” destination”; be open-minded about what you are going to see and don’t try to impose your own views and bias on the countries/people you visit. This semester I took Documentary Photography on Location with Professor Fassl. Our class went to Germany and stayed in Berlin and Munich for a week and a half. Throughout, we had to take photos for a group project in which we had to document the current state of some aspect of the cities in order to then propose a greener and smarter solution. That led me to experience the city in a different way then I normally would have when traveling. I was able to not only enjoy new experiences but gain a better understanding of how the city worked and what is was like both for its citizens and visitors. 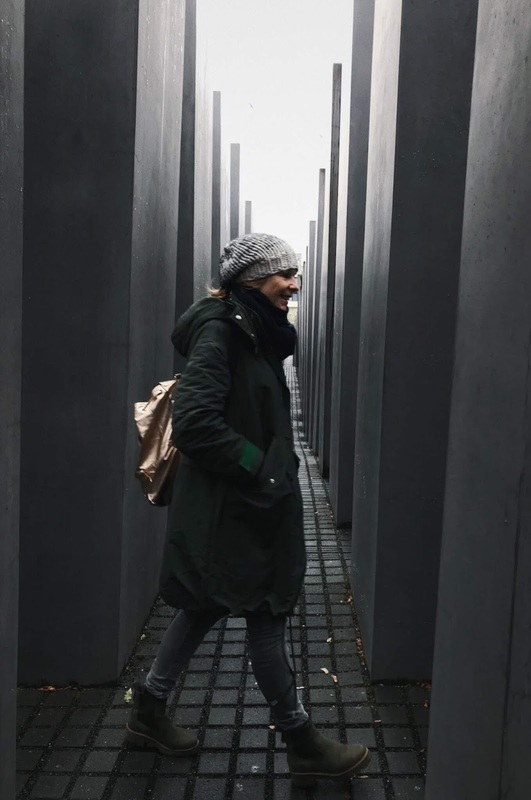 Our class stayed in Berlin for about three days, during which we saw the Berlin wall and took a rainy but very interesting tour about its history. We also took a tour of East Berlin during which we passed the Altes Museum which I later decided to return to. At the museum there were incredibly well preserved statues, paintings, and ceramics from Ancient Greece with more color and detail than I had seen before. And of course, while in Berlin, we also had some amazing food. We stayed in Munich for longer as it was Professor Fassl's hometown and we had three workshops on photography. We did workshops on street style, portraiture, and street photography. I also went to an optional workshop on drawing during our first day in Munich. 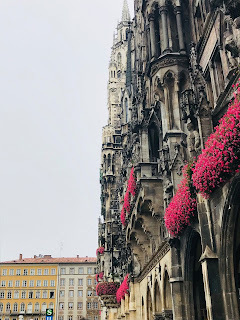 I felt like I got to know Munich much better than Berlin both because of the length of our stay and because it is a smaller city. 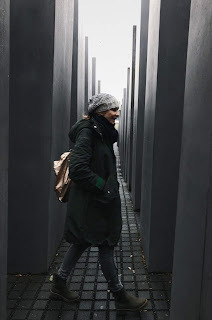 My experiences in Berlin and Munich were really satisfying as I got to see a new country and become closer to all the people in my class through the lens of a camera. 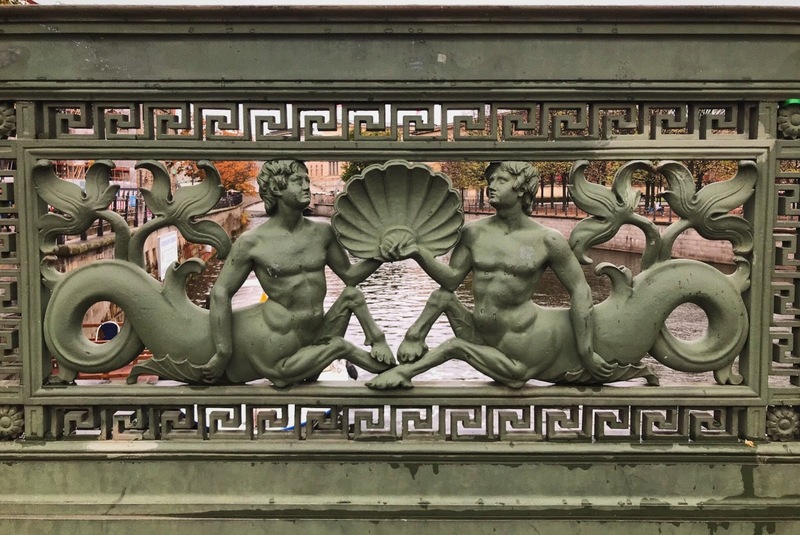 I would recommend to future students going on this travel to be ready to take lots of photos and to be excited and engaged with all the art, history, and artists you will see and meet! That's all for this semester's academic travel.